January 9, 2013 – IMS Trading Corp has announced it is voluntarily withdrawing its Cadet Brand Chicken Jerky Treat products sold in the United States until further notice. The Company is taking this action after learning this week the New York State Department of Agriculture and Markets found traces of antibiotic residue in samples of Cadet brand Chicken Jerky Treat products. These antibiotics are approved for use in poultry in China and other major countries, but are not among those approved in the U.S. 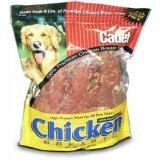 According to the company, Cadet Brand Chicken Jerky Treats are safe to feed as directed and have not been linked to any illnesses in dogs or humans. At first, New York State authorities requested that IMS Trading Corp remove Cadet Brand Chicken Jerky treats from retail locations only in the state of New York. Because of this request, the company has decided to conduct a voluntary withdrawal of these chicken treat products nationwide. “A double testing program is being established to check for these antibiotics in China (point of origin) and the United States before we consider to sell these products in the future. “There is no indication that the trace amounts of antibiotic residue are linked to the FDA’s ongoing investigation of chicken jerky products.